Web designers share their expert advice on how to carve out a successful and fulfilling career. In some professions, the shape and structure of your whole career is mapped out in fine detail from the start. You start by taking an accredited course, gaining specific qualifications and then moving up the ladder of clearly defined job titles and standard salary increments. Web design, though, offers none of that rigid structure, regularity or certainty. In an industry where the entire nature of what you do can change in a matter of months, there’s nothing predictable about where you’ll be in five years’ time. It’s no surprise, then, that when I asked on Twitter, “Have you always seen a clear path to career advancement, or has it been random and chaotic?” web designers responded overwhelmingly: ‘The latter’. 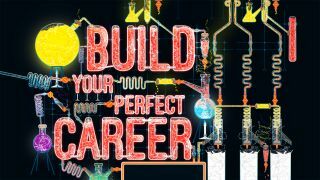 But while web design may lack the clear, predictable career structure of other professions, that doesn’t mean it isn’t important to put some thought into how you want your career to go. In this article, we speak to designers at different levels of the industry, to find out what worked for them, and how we can learn from their example. One of the biggest decisions you have to make throughout your career is whether to stick to a salaried role or go freelance. There’s no right or wrong answer here, but the kind of people who tend to write blog posts, give talks at conferences and pen articles for net magazine tend to be freelance, entrepreneurial types. So it’s easy to get the impression that this is the only route to career success. That’s certainly not the case, though. And if you dig a little deeper you’ll find countless examples of web designers who’ve carved out fulfilling and well-rewarded careers within a company structure. Take Paul Stanton, who’s been working as senior UI and UX developer for the software platform Jadu since 2012. And the good news is, it’s the kind of attitude that recruiters admire. As Jim Bowes, CEO and founder of London digital agency Manifesto, says: “Whether we’re hiring someone straight out of college or someone at leadership level, one thread is continuous: what we’re looking for is a real passion." A passion for what, though? Which brings us to the issue of whether to be a generalist or a specialist. The number of different specialisms in web design is increasing rapidly: whereas once it was just a choice between visual design and coding, there’s now frontend and backend development, interaction design, UX design, content strategy, not to mention a constant stream of new technologies such as virtual reality, augmented reality and conversational interfaces. Bowes reckons, though, that you can still be a generalist if that’s what you want. But you do need to tailor your expectations of who’s going to employ you accordingly. “For example, when we were a much smaller business, having multi-skilled people was super-useful, ” Bowes recalls. Whether you want promotion within your existing role or a new job with a different company, employers are looking for a mixture of passion and ability. So what’s the best way to show them you have both of those things? But that approach of applying for a job formally is more of an exception than a norm. Getting a job in web design is as much about what’s known as ‘cultural fit’ as skills and ability – that is, they work effectively with the team that's already in place. This means knowing how to network, and getting out there and interacting with people is vital if you want to land your dream job. If you’re not uber-confident socially, though, there are other ways to get noticed and impress employers with your passion and commitment. Bowes’ team, for example, is highly active on the open source communities around the specific programming languages, tools and frameworks they’re interested in. “Ideally I’d like to plan six months ahead who I’d like to join Manifesto ,” Bowes says. “And so if we can identify who those people are ahead of time, or even know where they’re going to come from – a meetup group or something like that – then that’s definitely something that we look to. “We also host our own open-source sprints, where people who work in WordPress, Joomla and Drupal are all coming together to do fixes and eat pizza and that kind of stuff. Plus we run a visual content meetup, which is all about cool new visual creative and motion content ideas that we see. And through that we build up a network of people that you know. In short, in an industry that’s never short of meetups, conferences, online groups or open-source projects to get into, there’s no excuse not to get involved in things that can help you meet the right people and boost your career. But be warned: employers will be checking your social media channels to check that you’re as passionate and committed as you claim. Although in-person or online networking will help you get your foot in the door, it won’t always get you all the way. There will usually be some kind of formal application process to go through, too, especially in larger companies. And it’s at this stage that the quality of your portfolio becomes all important. Speak to any employer in the industry and two things quickly become clear. The first is that spelling and grammar mistakes will damage your prospect enormously. That might seem obvious, but so many web designers fall down in this area, even at senior levels, that it’s constantly commented on by recruiters. So always get everything checked, double-checked and triple-checked by a reliable friend or colleague. Secondly, curating your projects carefully, and only selecting the most impressive work, is all important. In the real world, no-one has much time to spend looking at your portfolio, so it needs to be snappy and to-the-point. Also be aware that when it comes to the interview, you’ll be expected to discuss that work in detail. So ensure you’re not making claims you can’t back up, and if a project took place a long time ago, refresh yourself on the details beforehand. “Whether it’s a GitHub profile or a portfolio, we’ll always want to see examples of the work ,” says Stanton. “Even if it’s not anything that’s deployed in production, or still active, we like to see the thought process behind it. Being able to reference material like that will give us a load of talking points in the interview, and we may end up focusing on a specific project. If you’re at the very start of your career, of course, then building a portfolio for showing work is hard because you won’t have much in the way to put in it. If you're in such a position, take a look at our article on how to start building up your design portfolio. This article was originally published in issue 299 of net, the world's best-selling magazine for web designers and developers. Buy it here or subscribe.